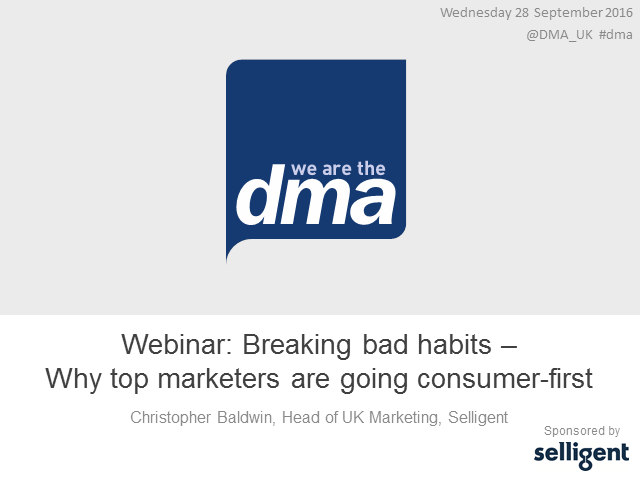 Join Selligent's head of marketing Christopher Baldwin who says traditional marketing models may be broken, but marketing is far from dead. Want to find out who won at the DMA Awards 2018 from the West? Join us to hear from the teams behind a number of DMA shortlisted campaigns from the West – examining strategy, creativity and results with a fine-tooth comb. Want to find out who won at the DMA Awards 2018 from Scotland? Join us to hear from the teams behind a number of DMA shortlisted campaigns from Scotland – examining strategy, creativity, and results with a fine-tooth comb. Want to find out who won at the DMA Awards 2018 from the North? Join us to hear from National Museums Liverpool and Mustard Media, the agencies behind some of the DMA shortlisted campaigns from the North – examining strategy, creativity and results with a fine-tooth comb. This is your chance to get a full update on the impact that the implementation of GDPR has had on the marketing industry. Chaired by the DMA’s John Mitchison, director of policy and compliance, you’ll hear from Zach Thornton, external affairs manager, DMA, who will offer insights as to how GDPR has driven a culture of change within the industry. Join Persado and learn how AI can be a powerful tool to improve customer relationships, drive personalisation, and help you to understand what makes a great piece of advertising tick. Join us and our DMA Awards 2018 winners, OLIVER, AXA PPP Healthcare and Propellernet for a session jam-packed with award-winning strategy, creativity, and insight from the super-talented teams on how they managed to attract the judges’ attention and win. Join Royal Mail MarketReach as we outline the benefits that mail can bring to enhance the overall customer experience. In today’s omnichannel world customer experience presents an ongoing challenge for marketers as they have to plan and deliver across multiple channels and touchpoints in ever complex customer journeys. Effective customer experience is a proven source of competitive advantage. So it is essential to carefully select channels, tactics, and touchpoints that not only drive sales but also cultivate engagement and trust. Get the latest need-to-knows on all-things privacy and regulation in our latest webinar series. A whistle-stop tour of everything from consumer awareness to the ePrivacy Regulation, data management to machine learning. Responsible Marketing guidance signed, sealed, delivered.Get the latest need-to-knows on all-things privacy and regulation in our latest webinar series. A whistle-stop tour of everything from consumer awareness to the ePrivacy Regulation, data management to machine learning. Responsible Marketing guidance signed, sealed, delivered. Conversational AI has snowballed in recent years and promises plenty of opportunities for marketers to connect with customers.As these interfaces continue to become more ubiquitous with every passing day, join the DMA alongside Zoovu and step into the world of conversational AI. With another year of disruptive digital innovation ahead of us, how do you stay ahead of the curve? Join Tesco and Mark Ash, CEO, Pure360, as we help you see through the smoke and mirrors to understand which are the key strategies you should be implementing to drive the biggest impact for your business. Customers are the lifeblood of your business. Understanding the behaviours that drive them will help you find new ones, keep them coming back and grow their lifetime value. Join us for a webinar that delves deep into understanding the consumer mindset. The Royal Mail MarketReach insight team will be showcasing new insights from a range of projects, including brand new neuroscience research that reveals how the brain reacts to advertising mail. May 25 marked the dawn of a new age in consumer privacy. But what actually happened? Join us for a detailed Q&A to have your questions answered. GDPR is here, and now there is another piece of legislation set to shake up the marketing industry: introducing the ePrivacy Regulation. Join us for a whistle-stop tour of everything you need to know about how the regulation interacts with the GDPR – and how it will affect your business. Never before has it been so important to understand how consumers think of data and their privacy. Alongside Acxiom, we’ll delve into our latest research report to reveal how consumers around the world really feel about sharing their data. The Direct Marketing Association keep you up to date with the latest news regarding anything to do with Marketing so that your company is always in the know.